Tell me this isn’t just the cutest damn thing you’ve ever seen. Changed up the colors since I’m partial to silver and black, but foxes rank right up there in my top echelon of all time favorite animals. 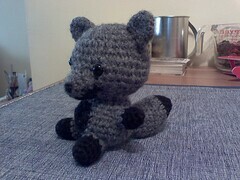 This was more of a stash buster since I have lots of gray and black, and no foxy-colors. That changed yesterday when I hit a nice sale at Michaels and scored some nice orangy-reds and clean whites. Expect to see more of these guys soon. ← Have you met my new friend, Helen? He’s a cute lil’ feller. I can picture him running amok amidst some sort of videogame environment. You have to catch him. Etc. How long did it take you to make him?